Matt Chahda says he will soon reapply for a CAMS Superlicence as he continues to shoot for a start in the Virgin Australia Supercars Championship. The 23-year-old is racing in the Dunlop Super2 Series after the failure to secure a Superlicence forced him to abandon a main game drive with Lucas Dumbrell Motorsport. Although planning to run the full Super2 season, Chahda is eyeing a co-driver role in the Pirtek Enduro Cup as well as a possible SuperSprint wildcard entry. Both options would require Chahda to be given dispensation for a Superlicence, which he hopes to earn with solid driving in the second-tier. LDM, which is currently fielding Taz Douglas on a round-by-round basis in the seat vacated by Chahda, is yet to secure a co-driver for either of its entries. “I will reapply for a Superlicence at some stage fairly soon just to keep ourselves there,” Chahda told Supercars.com. “Our plan is to get through Tassie and Phillip Island (Super2 events) and then completely reassess what we’re doing for the year. “I’d love the opportunity to be able to do a co-drive. It’s the way to work your way into the main game rather than just jumping straight in. 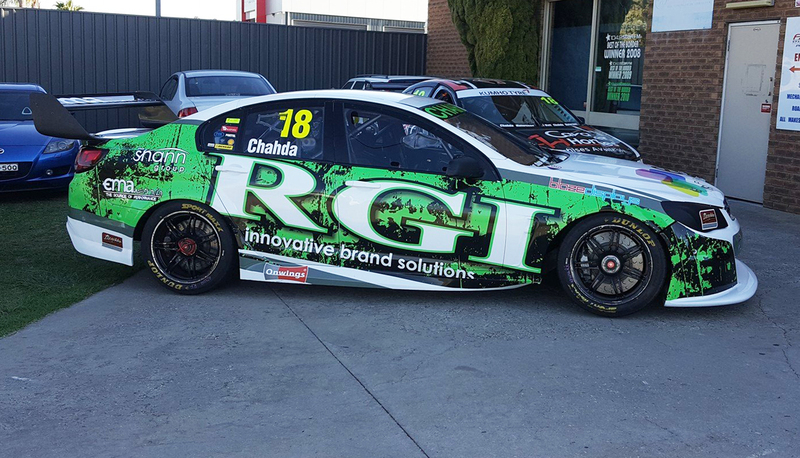 Chahda’s Albury-based family team is running a Holden leased from LDM in this year’s Super2 series. The car will sport a new look this weekend, with Albury signwriting company RGI stepping in to replace former sponsor Cavalier Homes. Chahda’s family is in for a big few weeks, with his sister due to give birth over Easter – the weekend between the Symmons Plains and Phillip Island Super2 events. For now, the team is focussed on moving up the field in Tasmania following a steady run in Adelaide that netted a best finish of 12th. “Before Clipsal my engineer (Laurie Frawley) had never even seen the car and it was all a bit of an unknown,” said Chahda. “Now we’ve had a chance to really go through the car and I’d say it’s the strongest position I’ve ever been in heading to an event. The Dunlop Super2 Series will have a 23-car field for its debut at Symmons Plains, with the line-up unchanged from Adelaide.